Gail Schechter, the executive director of Open Communities, speaks at the Illinois Holocaust Museum and Education Center. The lecture, called “Race and the Economy: Jobs, Housing, Poverty,” discussed housing segregation and inequality. The Illinois Holocaust Museum and Education Center hosted more than 120 people for a lecture and discussion on racial segregation and economic disparity Thursday night. David Stovall, a professor at University of Illinois at Chicago, and Gail Schechter, the executive director of Open Communities, spoke at the Skokie event about the economic and educational impact of segregated housing. 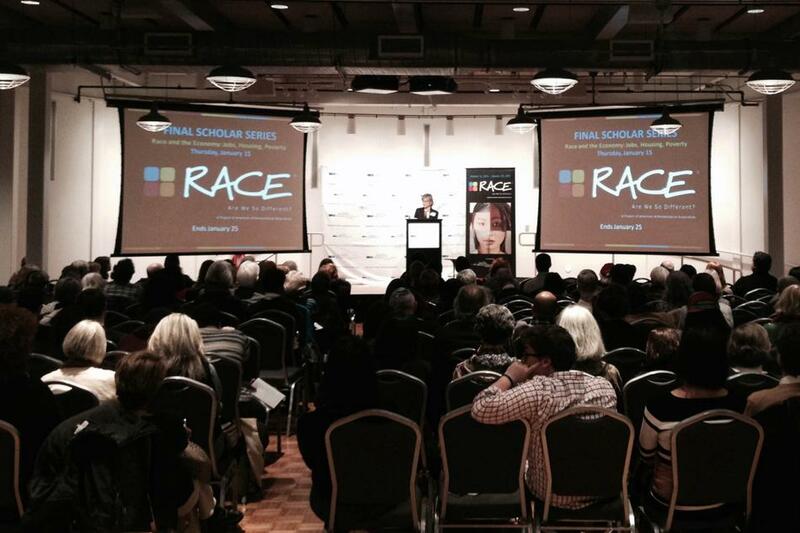 The event was co-sponsored by the YWCA Evanston/North Shore and the museum’s “Race: Are We So Different?” exhibit. Stovall, who told The Daily his expertise came from complimentary backgrounds in academia and in hands-on work in high schools, spoke first. He claimed wealth accumulation is the key variable in black communities and spoke about the historical case study of North Lawndale in west Chicago, where a black population replaced a Jewish one. He said he disagreed with people such as economists Paul Krugman and Thomas Piketty. Piketty’s book “Capital in the Twenty-First Century” argues inequality is a natural byproduct of wealth accumulation, whereas Stovall claimed that racial wealth disparity has often been intentionally manufactured. Schechter supported Stovall’s message but focused more on local housing. She advocated intentional action by the government to undo entrenched inequalities. “Because racial segregation was created by deliberate policies, (we need) social engineering to get out of that,” she said. Schechter spoke about what she called the “Dorian Gray” effect, where the suburban “Wilmette brand” only has value when juxtaposed against poorer neighborhoods. “You can’t have extreme wealth without extreme poverty,” Schechter told The Daily after the lecture. Each culture needs to be accepting of integrated communities before change can be effective, she said. However, widespread myths about integration impede change, she added. She said throughout her experience with Open Communities, an organization that promotes ethnically and economically diverse neighborhoods in Evanston and north suburban Chicago, she has seen how racially based housing segregation is. A Q&A followed the lecture. State Rep. Robyn Gabel (D-Evanston) asked the last question of the night. She thanked the two speakers for their work, insisted that education is both misfunded and underfunded and asked for concrete solutions to the problems discussed. Stovall gave three solutions: revisit the student assessment system, abolish Teach For America or other programs he said served mostly as feeders to law school and end the edTPA, a system he said evaluates teachers by a taped video of one class. Without context, the teachers with backgrounds similar to their students will be filtered out, which “keeps teachers white” he said. Schechter said the Illinois Affordable Housing Planning and Appeal Act needs a stronger bite against slow implementation. Stovall also proposed ending mayoral control over democratically elected school boards. He told The Daily areas that need the most help should have teachers who are both highly qualified and connect with students. “You need to understand political economy of place, but they also need the skills,” he said.